Scitec Nutrition BCAA Xpress provides a full 5 grams of micronized BCAAs in the proven ratio of 2:1:1. Proven to be highly anabolic, BCAAs stimulate protein synthesis which leads directly to muscle growth. They also prevent muscle protein breakdown, which makes them anti-catabolic as well. Taken intra-workout, BCAAs delay muscle breakdown and help support recovery and repair. Has 7 Refreshing flavors, including 2 mouth-watering flavors for the summer season - Mango and Melon! SCITEC NUTRITION BCAA XPRESS can be used by muscles cells as an energy source, which may help offset muscle breakdown during endurance exercise and help support faster recovery and repair after weight training. Even though they are intrinsically present in first class proteins, they are required in additional amounts especially for exercising individuals and athletes for their stand-alone benefits apart from their obvious role as building blocks of proteins. Thus, it becomes an ideal intra-workout as well as a post-workout supplement. Mix half scoop of SCITEC NUTRITION BCAA XPRESS in 300ml of cold water and consume during workout. Q.1 What does SCITEC NUTRITION BCAA XPRESS contain? SCITEC NUTRITION BCAA XPRESS provides a 5,000 mg (5 g) blend of the three Branched Chain Amino Acids (L-Valine, L-Leucine, and L-Isoleucine) in every serving. Q.3 What is the ideal time to consume SCITEC NUTRITION BCAA XPRESS? The ideal time to take SCITEC NUTRITION BCAA XPRESS would be during workout. 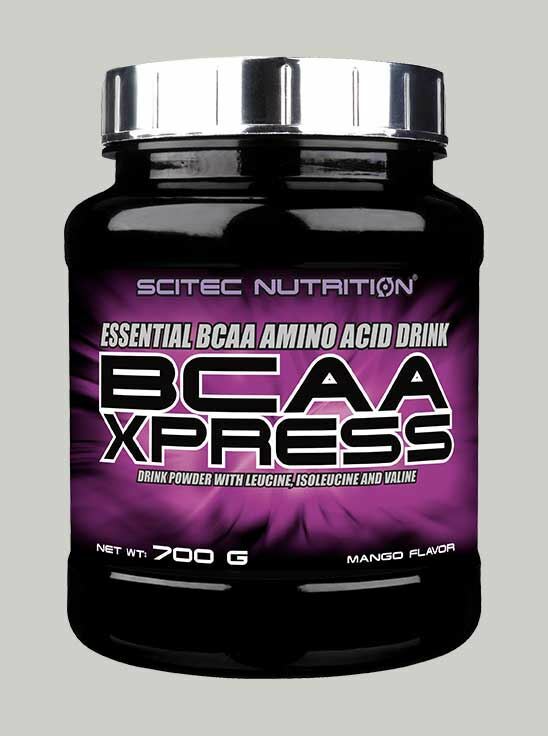 Q.4 Is SCITEC NUTRITION BCAA XPRESS stimulant free? 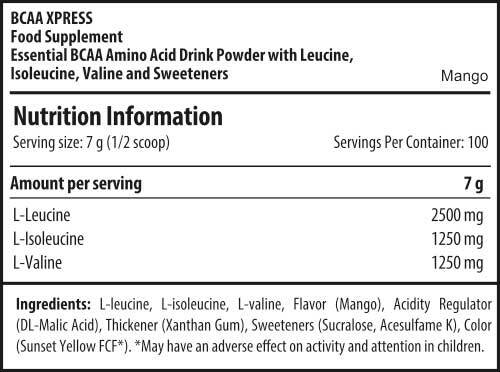 Q.5 Are there any side-effects of SCITEC NUTRITION BCAA XPRESS? Q.6 Can SCITEC NUTRITION BCAA XPRESS be consumed by vegetarians? Q.7 For muscle gain, is BCAA supplementation importa­­­­­nt or Whey is enough?